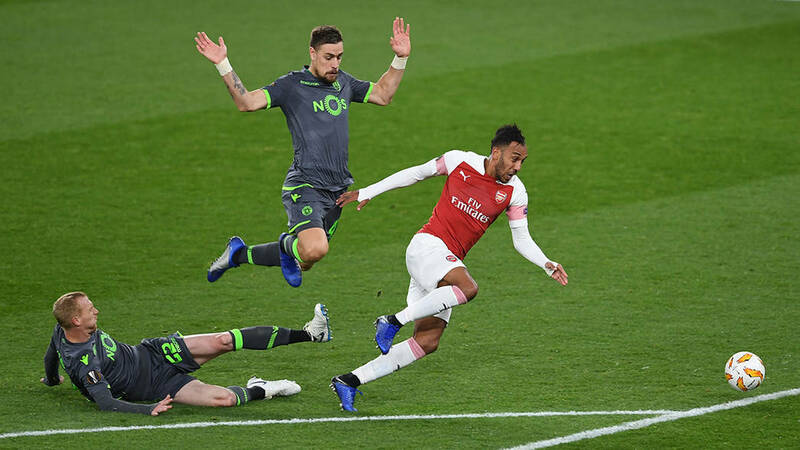 Arsenal followed the 'if you can't win, don't lose' approach in Thursday night's Europa League match with Sporting Lisbon, and unlike in the first leg of the tie which came up two weeks ago, the Gunners could not get a goal in the encounter which ended 0-0. We saw a massive reshuffle of the side that drew in the big game with Liverpool on Saturday. Every other player that featured against the Reds, except Rob Holding and Henrikh Mkhitaryan (Man of the Match: Arsenal vs Sporting CP), was left out of the starting line up either through total omission from the squad or bench placement. Pierre-Emerick Aubameyang for instance came in as a substitute. He got his attempt at goal blocked in the second half shortly after his strike had hit the woodwork. The Gabonese later became the tool for the reduction of Sporting to 10 men. Defender Jeremy Mathieu saw a straight red following a foul on the striker with just three minutes to regular time. The resulting freekick taken by the fouled went over the bar. The game ended with the nets not tasting food. That was the second time we failed to score in a game under Emery. The first was in our 2-0 loss to Manchester City in the first Premier League game of the season - Unai Emery's first competitive game in charge. Being unable to secure a win was saddening but more hurting was Danny Welbeck's serious injury which visibly affected other members of the team due to its severity. The English international injured his ankle when he attempted to make a header but landed badly. He was attended to by about 10 members of the medical crew who supplied him oxygen, put his leg in a protective brace before takimg him off on a stretcher. He has since been taken to hospital for further treatment, as revealed by Unai Emery. It's painful that we have lost Welbeck through another injury. We hope he ends up victorious like in previous experiences. Get well soon Danny! Also injured was Stephan Lichtsteiner who withdrew through what looked like a hamstring problem. We hope it's nothing serious.